IRT Consult, Inc. will deploy Specialist Thermal Imaging Equipment to pinpoint the source of any potential leak that may be present on your site. Typically we can monitor on average 3,000 + components per hour which offers considerable time and cost savings when compared against the typically 500 components being monitored on a daily basis using traditional "Hand-Held Sniffer" Technology. With surveys being undertaken from the ground and in the case of pipelines we can survey transmission lines from the air in a fraction of the time when compared with traditional methods. 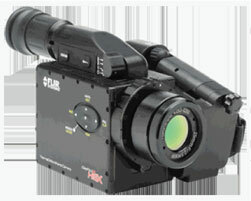 We use the Flir Systems ThermaCAM GasFindIR HSX thermal imaging camera to identify fugitive VOC Leaks. The leak appears as black smoke in the recorded video clip(s), this allows for accurate identification of leaking components especially where many components may be positioned close together. This is an exciting new method of leak detection and each site will be unique so please contact us and we will gladly discuss your project with you in terms of price, duration, availability and applications.